This fast-flying summer visitor always generates excitement. Fortunately, it likes to nectar on flowers, and so is sometimes found close to the ground. One of our southern immigrants, its late summer arrival is increasingly predictable, but it has not been shown to survive the winter here. Occasional influxes of Cloudless Sulphur have taken place along the southern coast of New England since at least the late nineteenth century. Scudder (1899: 1058) mentions specimens from Fall River and New Bedford, Massachusetts, Newport and Narragansett Pier in South Kingston, Rhode Island, and New Haven, Connecticut. At Narragansett Pier, collector Howard L. Clark reported that in 1869 or 1870 there was “…a rough, marshy meadow, back of the beach …The eubule [Phoebis sennae] were swarming about the brilliant cardinal flowers, which grew in abundance, and their numbers were constantly augmented by new arrivals, which all appeared to come from the south...[They] appeared to have been on the wing for a considerable time…I obtained, however, some two dozen fair specimens and some nearly perfect. They were common about the place for several days, and then gradually disappeared” (quoted in Scudder 1889: 1060). Cloudless Sulphur was “very common in summer of 1880 around Wood’s Hole" on Cape Cod, according to a Mr. Webster (whose specimen is in the Harvard MCZ). There are also pre- 1900 reports from Nonquitt (near New Bedford on the southern Massachusetts coast), by Miss Caroline Soule, and from Bridgewater by A. G. Weeks (Farquhar 1934). There is a pre-1934 report from Cohasset, and there are male and female specimens from Chatham from September 1921 in the C. J. Paine Collection in the Harvard MCZ. Both Nantucket and Martha’s Vineyard were important areas for early sightings of Cloudless Sulphurs. On Nantucket, the species was “not uncommon in 1892 in September” (Farquhar 1934; Jones and Kimball 1943). F. M. Jones knew of specimens from 1934, September 1937, and September 1941, and some of these specimens are still in the Maria Mitchell Museum on Nantucket (LoPresti 2011). On the Vineyard, Cloudless Sulphur was reported in 1909 by several collectors; on the “Island of Chappaquidick” twelve were seen on September 21, 1909 by G. R. Minot. 1934 and 1937 were also years of observed abundance on the Vineyard as well as on Nantucket (Farquhar 1934; Jones and Kimball 1943; see also Cassie 1999). There is a gap in the historical records of Cloudless Sulphur between the 1940’s and 1980’s. During the MAS Butterfly Atlas period, 1986-90, there was one fairly large incursion, in 1987, with a maximum of 9 to 12 seen at Westport on September 27, 1987 (cited in B. Cassie, Atlas species account). That year, Cloudless were reported from Chatham, Gosnold Naushon Island, Dartmouth south, West Tisbury and Dedham, with specimens taken at Dedham, Dartmouth and West Tisbury. The next large flight of Cloudless Sulphur to reach Massachusetts was in 1993. Naturalist Richard Forster provides a nice account of this flight in the MBC journal Massachusetts Butterflies, describing his excitement at finding 10 Cloudless Sulphurs while birding on Morris Island in Chatham on September 13, 1993 (Forster 1994). Sightings were also reported that year from Plymouth Manomet, Chatham Monomoy Island, Gosnold Naushon and Cuttyhunk Islands, Edgartown and Aquinnah on Martha’s Vineyard, Yarmouth, Wellfleet, Orleans Pochet Island, Scituate, Dartmouth -- and as far north as Gloucester Eastern Point north of Boston. However, early and noticeable flights in New York in 1992 apparently did not reach Massachusetts (Lep Soc News 1992 Season Summary). The main host plants for Cloudless Sulphur in the northeast are Partridge Pea (Chamaecrista fasciculata), Wild Senna (Senna [=Cassia] hebecarpa), and Wild Sensitive Plant (Chamaecrista nictitans). All these are native to almost all counties in Massachusetts (Sorrie and Somers 1999). The butterfly also uses Maryland Senna (Cassia marilandica), which normally grows further south. These host plants are nearly the same as those for the Little Yellow (Eurema lisa), another late-summer southern immigrant. Eggs and larvae have been found on Partridge Pea in Connecticut (O’Donnell et al. 2007; see photos on p. 155). 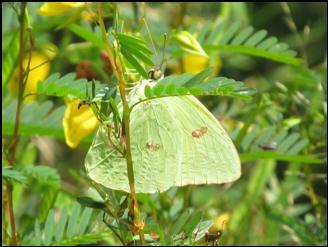 Cloudless Sulphur has been found in association with Partridge Pea in Massachusetts, such as in the photo above from Mattapoisett in August 2012. During the 1998 invasion Cloudless Sulphur was credibly reported to be ovipositing on Clotbur (Xanthium spp.) in Chatham, Massachusetts. R. Pease and K. Parker observed carefully, reporting that "...laying eggs required some particular dexterity to thrust the ovipositor between the spine of the burs. During the time we were there there were always two or three females in the process of laying eggs on the plants, preferring the fruits but sometimes the leaves." Why this plant, unrelated to cassias, was chosen remains a mystery, and there is no information as to whether the larvae actually hatched and survived (Cassie 1999). One generation in Massachusetts may be possible on the Senna and Chamaecrista host plants, depending on when the butterflies arrive, but the species does not over-winter as far as is known. Cloudless Sulphur is fond of tubular flowers for nectaring, and will visit honeysuckle, trumpet vine, cardinal flower, hibiscus (including Rose of Sharon), and sennas, among others (Scudder 1889: 1059; Gochfeld and Burger 1999; Allen 1997). Cloudless Sulphur is a year-round resident at least as far north as North Carolina. As Cech (2005) remarks, why large numbers of this species fly further north each year, never to return, is a mystery. BOM-MBC 1992-2013 records show Cloudless Sulphur reaching the state in 14 of these 22 years (Chart 12). Two major flights are recorded, in 1998 and 2002. The numbers reported in 1998 far outstrip those for any other flight in the Atlas and MBC periods. Writing in Massachusetts Butterflies Brian Cassie termed the 1998 flight an “invasion,” lasting 106 days and producing the highest site concentrations yet known (Cassie 1999). This flight also produced the first observation of egg laying by Cloudless Sulphurs in the state. An extensive migration into Connecticut also occurred in 1998. In 2010 only nine Cloudless Sulphurs were reported, and in 2011 only two. In 2012 there was a somewhat larger, though still modest flight into the state, with 28 reported through August. A new location for the species was found that year, Nasketucket Reservation on the southern coast at Mattapoisett. Several Cloudless were found there among a colony of Little Yellows, on the fairly early date of 8/13/2012, first reported by W. Miller and B. Volkle. Overall, through 2012, the 1998 and 2002 flights into Massachusetts remain the most significant in terms of numbers seen. The Breed et al. (2012) list-length analysis of MBC data 1992-2010 found a statistically significant -37.7% decrease in Cloudless Sulphur sightings over that time period. This result reflects the recent low numbers compared to the 1998 invasion, and may not be indicative of a longer-term trend. Between 1992 and 2013 Cloudless Sulphur was reported from 36 towns, almost all on Cape Cod, the Islands, and along the eastern and southern coasts. It was reported from all towns on Martha’s Vineyard (Aquinnah, Chilmark, Edgartown, Oak Bluffs, Tisbury and West Tisbury), and from Nantucket (1, 9/8/2005, B. Benner). On Cape Cod, Cloudles Sulphur has been seen in Barnstable, Chatham, Eastham, Falmouth, Gosnold (Elizabeth Islands), Harwich, Orleans, Sandwich, Wellfleet, and Yarmouth. Further north on the east coast, it has been reported from Plymouth (Manomet), Scituate, West Bridgewater, and Boston. On the south coast Fairhaven, Marion, Mattapoisett (Nasketucket Reservation), Dartmouth, and Westport are the towns with sightings, while north of Boston there are reports from Marblehead, Gloucester (Eastern Point), Rockport (Halibut Point TTOR), Topsfield, Rowley, and Newbury (Old Town Hill TTOR). Further inland, there are markedly fewer reports. There are only three from Worcester County: Douglas (1, 9/15/2002, R. Hildreth), Boylston (2 on 9/22/2012, E. Barry), and Petersham (1 on 9/4 and 9/18/2007, J. Baird), and only one from the Connecticut River valley: Northampton (see 10/4/2005 photo on MBC website by B. Spencer). There have been no reports from Franklin or Berkshire counties. The specific locations which have been the most productive are Chatham (Monomoy NWR and Morris Island); Orleans (Pochet Island); Gosnold (Elizabeth Islands, e.g. Cuttyhunk, where 8 were reported on 9/21/2013, B. Cassie), and the Westport/south Dartmouth areas (MAS Allens Pond, Gooseberry Neck, and Horseneck Beach). During the Atlas period, 9-12 individuals were reported September 27, 1987, in Westport. The greatest numbers of Cloudless Sulphers in Massachusetts are seen in September, and the second greatest numbers in October; see the MBC flight chart http://www.naba.org/chapters/nabambc/flight-dates-chart.asp . EARLY DATES: The earliest date in MBC 1992-2013 records is 1 seen on 6/25/2000, Chilmark, A. Keith. All other first sightings begin in August. The record earliest date is 8/4/2013, 1 seen at Mattapoisett Nasketucket Reservation by M. Arey. The next earliest dates are 8/8/1993, 1 seen at Manomet by M. Kasparzyk (this kicked off the fairly large influx of that year), and 8/13/2012, 1 seen at Mattapoisett Nasketucket by W. Miller and B. Volkle, while visiting the newly-discovered Little Yellows colony at that site. (Also see photo above from that site). The next earliest ‘first sighting’ dates are 8/21/2002 Chilmark, A. Keith and M. Pelikan; 8/22/2006 Wellfleet, K. Holmes; and 8/22/2004 Oak Bluffs, M. Pelikan. LATE DATES: In MBC 1992-2013 records, the latest reported date is 1 seen 12/4/1998 in Edgartown, Wendy Malpass fide M. Pelikan. There are other December and November sightings on the Vineyard in that major invasion year. Other late dates are 11/13/2001 Chilmark A. Keith; 10/31/2006 Dartmouth Allens Pond T. Raymond; 10/26/2012 Falmouth, A. Robb; 10/23/1995 Dartmouth, B. Cassie; and 10 on 10/21/2007 Chatham Morris Island, B. Nikula. The latest known date during the Atlas period was 10/7/1987, Dedham, D. Schweitzer (specimen taken). If Clouded Sulphur arrives early enough, there is probably time for one brood cycle at these latitudes, but there is no evidence so far of successful over-wintering. However in nearby Rhode Island, it is just possible that successful over-wintering has occurred; the evidence is two specimens, a female taken 4/7/1994 and a male 5/7/1994. These are apparently the earliest records ever for New England, and they followed a mild winter. The Cloudless Sulphurs were apparently attracted by a rather large patch of Senna (=Cassia) marilandica which had been planted in a residential garden. (W. D. Garrahan, Lep. Soc. News No. 3 and 4, 1994). Cloudless Sulphur sightings have increased in Massachusetts since the Atlas period, although search effort has also increased. The species has also apparently increased in New Jersey since the 1980’s (Gochfeld and Burger 1999). However influxes into Massachusetts continue to vary from year to year, and some years still bring very few if any sightings. A priori, this species might be expected to increase with climate warming, but we do not list it on Table 6, with other climate-change increasers and decreasers. Successful survival over the winter in most parts of New England is still quite unlikely, and the factors determining Cloudless Sulphur’s arrival and abundance in Massachusetts are mostly to be found in regions to the south of here. Since these factors are still not clear, prediction is difficult as to whether sightings will continue to increase here.